In a bowl, whisk the egg yolks with the vinegar, salt & pepper.. Add the sunflower oil very slowly to the egg mixture, constantly whisking until you get a creamy consistency.. Then add the garlic chili and the togarashi if you wish (this makes it a little spicier) and set aside..
Drench your prawns in a little flour and set them aside.. Heat a pan on med- high heat, add sunflower oil and fry the prawns about 1-2 minutes on each side (depending on the thickness).. 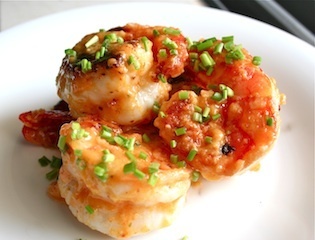 When they are ready and start to curl, take the pan of the heat and add the spicy creamy sauce.. Toss the prawns in the sauce and place the pan on low heat for just a little to heat the sauce, but not long enough for it too curdle too much.. Now sprinkle with chives and voila! You can serve this delicacy on its own, with a salad, steamed rice or egg noodles.. Enjoy! *Little tip.. If you wish to deep fry using a tempura batter, (either home-made or a pre-made one from the Asian isle) follow the same steps as above but add more oil to your frying pan.. The sauce will curdle less as the dough absorbs most of it.. Also yummy!